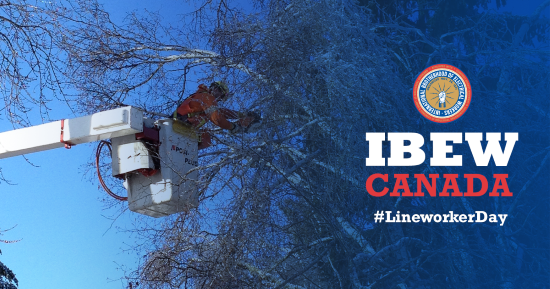 A push is on in Canada to designate July 10 as National Lineworker Appreciation Day there, and IBEW International President Lonnie Stephenson is encouraging all members in the union’s First District to help make it happen. At an Oct. 2 event near Canada’s Parliament buildings in Ottawa, First District Vice President Tom Reid joined representatives from the Canadian Electricity Association in launching a campaign to convince Canada’s lawmakers to set July 10 as the official appreciation date. Residents of Canada can help boost this effort by signing an online petition posted on the House of Commons website. The electronic petition is sponsored by Member of Parliament Daniel Blaikie, a member of Winnipeg, Manitoba, Local 2085. Over the years, various dates have been designated for honoring electrical workers’ contributions and sacrifices. But July 10 has particular significance to the IBEW, Reid noted: It’s the date in 1896 that Henry Miller, the union’s founder and first president, died on the job. Reid said that taking a day to acknowledge the sacrifice and risk inherent in a lineworker’s job is the least we can do. “There are nearly 70,000 IBEW members in Canada, many of whom face working in challenging weather and at heights, in addition to the risks of cuts and high-voltage burns,” Reid said. “These highly trained men and women work efficiently, safely, and collaboratively to keep the lights on across Canada." While only residents of Canada are eligible to sign the online petition, Stephenson encouraged anyone to join in the effort to get the issue trending on Facebook and Twitter by posting messages that includes the hashtag #LineworkerDay. Meanwhile, IBEW members continue to lobby the U.S. Congress to officially designate July 10 as National Lineworker Appreciation Day. At last count, 27 co-sponsors from both parties had signed on to House Resolution 986, Rep. Linda Sánchez’s most recent resolution supporting that effort. July 10 is officially Lineman Appreciation Day in Sanchez’s home state of California, thanks to the efforts of locals there.